Thousands of pilots have earned their wings with the Hangar 9® Alpha™ trainer. Now, Hangar 9 introduces an updated version of this ever-popular traditional high-wing trainer with the added benefit of DSM2™ technology that provides freedom from frequency restrictions and interference. And, this Alpha has a completely modernized look that makes it a great-flying and great-looking aircraft. The Alpha 40 DSM2 RTF is the first glow trainer to come equipped with Spektrum’s advanced DX5e 2.4GHz DSM2 5-channel full range aircraft system. Besides providing freedom from frequency restrictions and interference, the DX5e’s DSM2 technology offers superior performance with a secure link for glitch-free performance. The system also includes the Spektrum AR600 receiver. The DX5e is not only perfectly suited for the Alpha 40—it can also be used to fly just about any type of model where 5 channels are appropriate due to its full range capabilities. With the ready-to-fly Alpha trainer from Hangar 9, success is all but assured, thanks to its gentle, beginner-friendly flight characteristics and the ingenious, hassle-free Evolution Trainer Power System that makes the Alpha the easiest-starting, smoothest-running trainer available. With the engine and radio gear installed, the Alpha 40 is ready to fly in just minutes. This easy-to-fly trainer is perfect for first-time pilots because of its super-stable, self-righting flight characteristics. 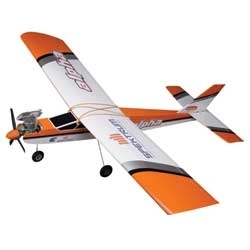 And, club instructors will find the Alpha 40 to be the most valuable tool for teaching new pilots the basics of RC flight.